I took up road cycling nearly eight years ago, and it has changed my life in many ways. There’s so many amazing things about riding a road bike and here’s my top ten great reasons for women to take up road cycling. If you do enough kilometres (or miles) on your bike, no matter how fast or slow, you will improve your fitness. As a result of cycling I’m the fittest I’ve ever been in my life. I have met literally hundreds of great people through cycling and many of them have become great friends. Cycling creates a great bond with other people. Many of my cycling buddies are men, and most come from completely different backgrounds than me, which makes life really interesting. As well as fitness, if you do enough riding you can expect to tone your body. Most people won’t actually lose weight as a result of exercise unless they change their eating habits as well, but most will feel more toned. It has certainly worked for me. Road cycling has made me more confident of my physical ability and this has permeated into other aspects of my life, making me a more happy and confident person. When I first started riding I was amazed at the number of kilometres I could clock up. I was constantly setting new goals and challenging myself to reach the next milestone. I’d never really been a goal focused person until I took up riding. It’s made me see the benefit of challenging myself in other aspects of my life too. Many of us learnt to ride a bike at a young age but if you are anything like me you didn’t really learn any bike skills. To become a competent road rider you need to learn a whole new set of skills like cornering, climbing, descending and more. Learning new things is great for the body and the mind. Until my partner and I took up cycling we never really felt like part of the community in which we live. Now we have dozens of friends who live in the same suburb and surrounding suburbs, and feel like part of something good. It’s a very safe and nurturing sort of thing. This is a big one. I will admit that I still dislike parts of my body (that comes from a lifetime of negative self-talk) but overall I’m pretty satisfied with how my body looks and works. In my twenties I exercised in oversize T-shirts to hide myself away. Now I proudly strut around in lycra. 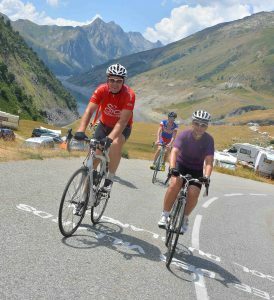 I’ve been on many holidays that have been focused around road cycling , from weekend getaways to ten week European tours. It is something that can take you anywhere. But beware of excess baggage bills! My overall quality of life – mentally, physically and spiritually has improved as a result of taking up road cycling. I’m confident that as I age, I will maintain my quality of life because I’m fit and healthy, and have a positive outlook. I’m not in denial about getting older (no facelift for me), I want to embrace it, and be the best I can be. So those are my ten great reasons for women to take up road cycling. What are yours? Please share via the comments or Women Who Cycle Facebook page. As cycling can take up a fair bit of your weekend or weekend away, it’s a way of spending a lot of time with your partner. I’ve had a few guys comment how they wish their partner cycles.